Is your boat's rod locker disorganized? Tired of the hassle of removing tangled rods? A custom built rod rack will virtually eliminate line tangles and gives you the ability to stow or deploy any rod from any position with ease. 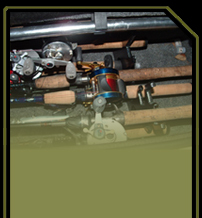 This unit can be made to fit in any boat and will organize any rod locker, putting an end to tangled rods. Customer supplied measurements or template makes this patented design truly custom. The one of a kind finish makes it REEL UNIQUE. Each custom built rod rack is hand built to the customer specs. from start to finish and includes the rear handle holder, front tip holder, rod tip protector tubes, installation hardware and instructions. The handle holder and tip holder are made from durable, waterproof 1/2" HDPE plastic. iComing Soon Custom Tackle Box Storage for Bullet Boatsxt. Click here to aMade In The U.S.A.dd text.